On December 27, 2017 I reported a security issue directly to the security team as their CONTRIBUTING.md recommends. I received an automated response that a human would follow up with me soon. It was their end of year, two week vacation (which is awesome!). I sent the same email again on January 26, 2018 and received a response back from AJ Bowen, a Build Infrastructure Engineer at Travis CI on January 29, 2018. They'd created an internal issue to track the behavior and would follow up within two weeks. I followed up with AJ on February 28, 2018 and didn't receive a response. We're now over three months since my initial report. I believe it's time to make this more public so that others know to be careful with their Travis CI managed environment variables. 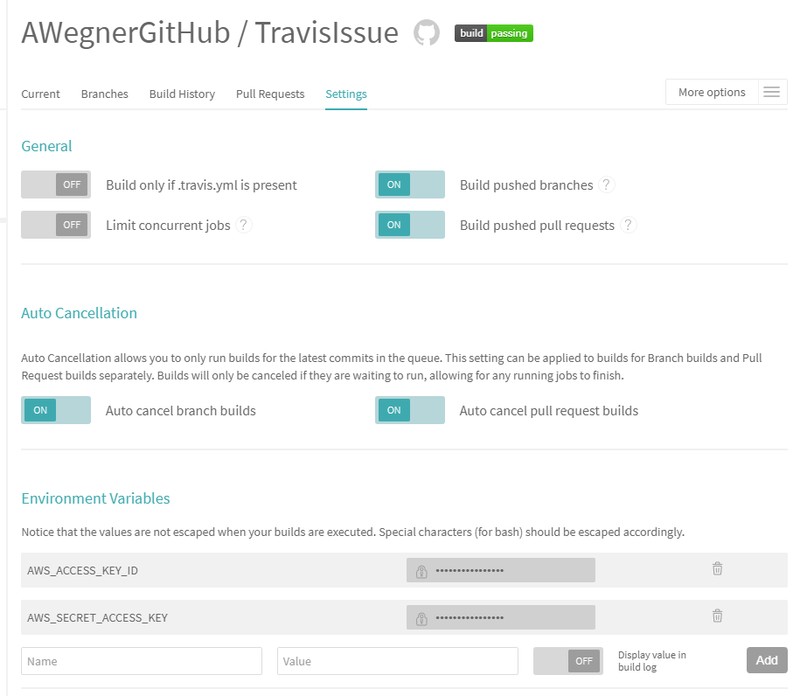 Travis CI is an application that allows you to automatically test and deploy applications after a commit is pushed to GitHub. I've used this ability to run unit tests, automatically deploy updates to PyPI, and more recently when testing deployment to AWS using the Serverless framework. It's that last one that led me to this issue. Part of deploying to AWS requires that you have credentials to deploy. I didn't want to put my AWS deploy credentials in GitHub, even if they are encrypted. Instead, I decided to set my variables in the Travis CI Settings. I went forward with my testing, watched the deploys happen as expected and eventually needed to transfer my repository to a third party. I used GitHub to transfer the repository to the new owner. We tested a build and watched it deploy. The Travis CI console showed a successful deploy. The problem is, it deployed to my AWS account using my AWS credentials. These "secure" environment variables had been transferred to a third party and were no longer in my control. Transfer the GitHub repository to another account. At this point, the environment variables defined in step 2 are accessible by the new owner from step 3. 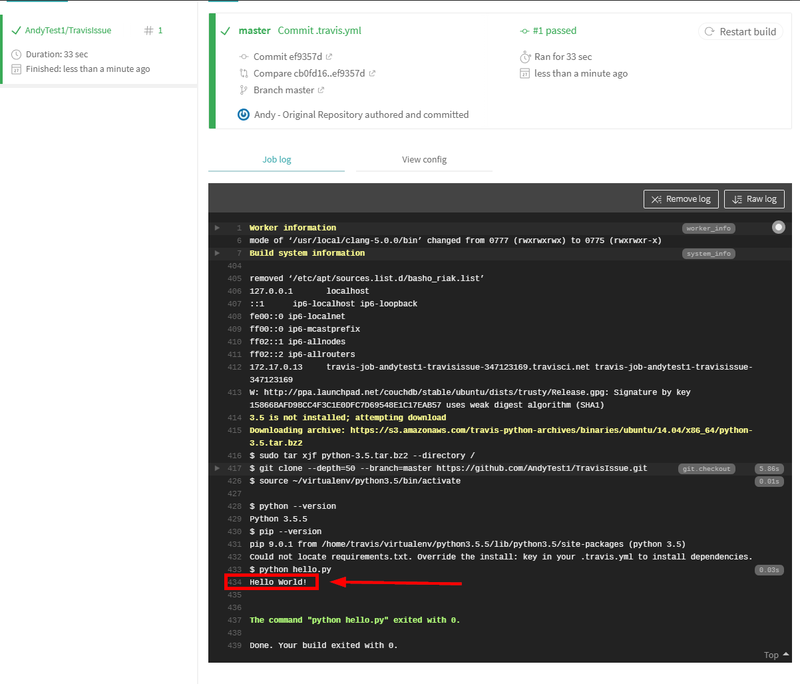 The detailed steps taken to reproduce this issue show that Travis CI is simply looking for the environment variable values and scrubbing those from the build logs. Once transferred, an edit can be introduced to show these variables with minimal work. 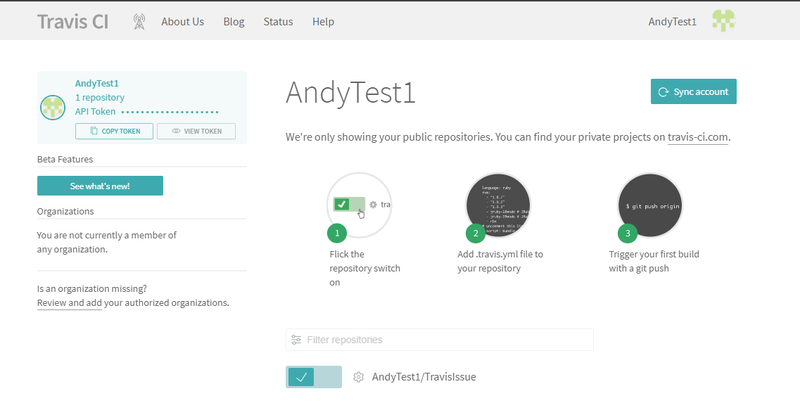 Create a new repository and add something. For this test, I created a simple Python Hello World file, and named it hello.py. Commit this change to your new repository. Go to Travis CI and log in with the GitHub account associated with the above step. Sync your account. 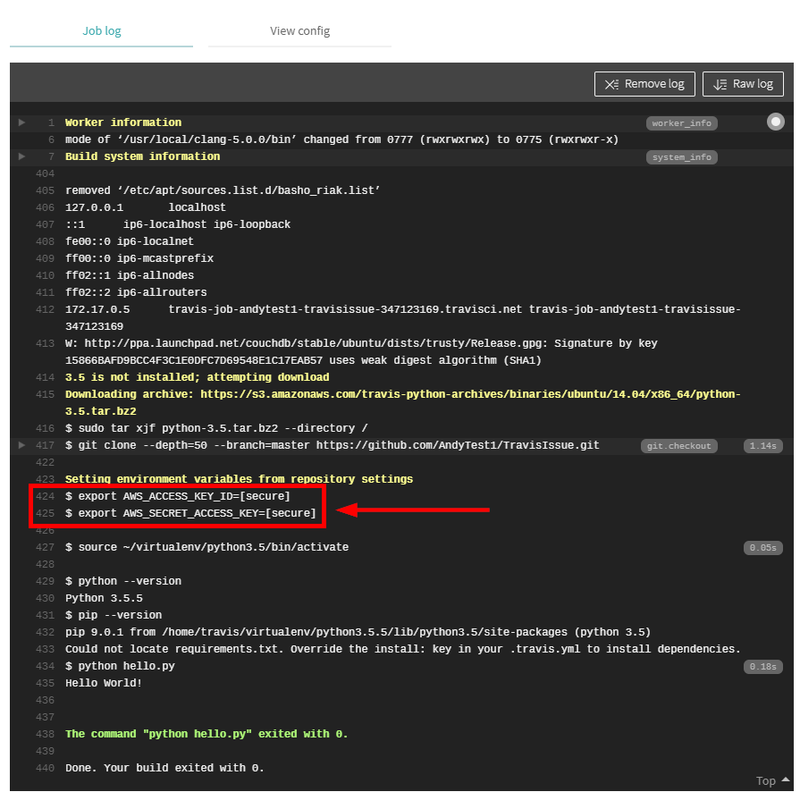 Then enable integration by changing the repository switch. 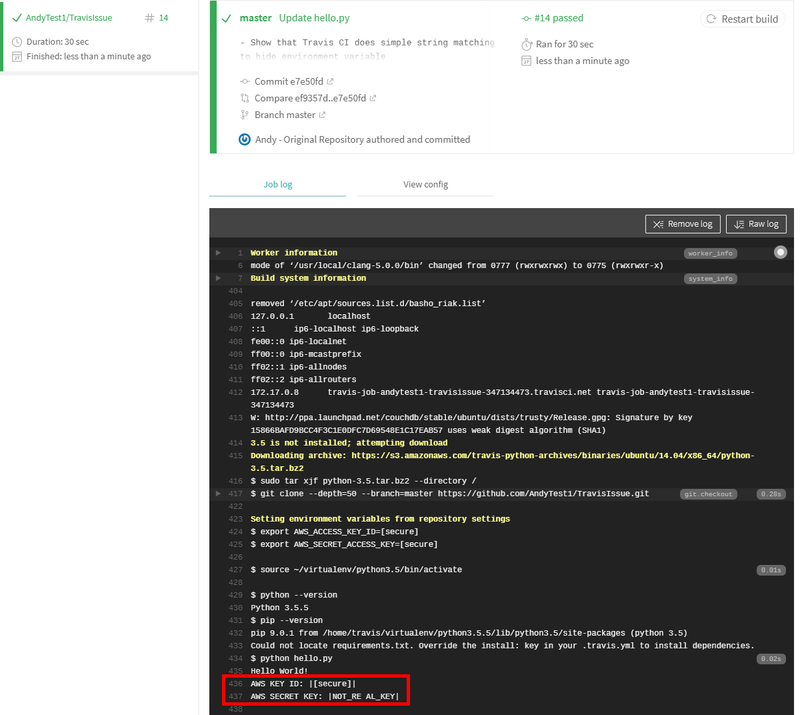 With the integration now in place, set up a basic build script by adding a .travis.yml file to the repository. This script will set up a build task and run your hello.py file, using Python 3.5. You will see that "Hello World!" is printed in the build console. Now that our build script is working, we can work on "deployment". Deployment to AWS (or other cloud services) requires that you provide credentials. I am not a fan of including credentials in my repository, even if they are encrypted. Opting for an environment variable should be more secure, as the credentials are never in your repository in the first place. It is important to note that you are still giving your credentials to Travis CI in this case. To set up environment variables, click on "More Options" and "Settings" within the Travis CI application. Now scroll down to "Environment Variables". Add the name of the variable and the value. Be sure to leave the default value of "Off" selected. You don't want to display this value in the build log. Finally click "Add". I've added a second variable for further testing. Notice that variable values are hidden from view after clicking "Add". With the variables saved, restart your build. When the build has completed, check the build log. Even though we aren't using these values yet, we can see the environment variables exist and are "Secure". These values are not actually secure. Travis CI is filtering for the values of these environment variables and if the specific string is found, it is scrubbed from the log. We can see this with a small change to hello.py. For AWS_SECRET_ACCESS_KEY, we split the two halves with a space and print it out. This will be shown, because the extra space no longer matches the exact value of the environment variable. As expected, the first pattern is hidden because it matches the environment variable. The second pattern is shown, because the space in the middle means the pattern no longer matches. Now that we've shown the variables are accessible, it's time to transfer the repository to a new owner. In GitHub, this can be accomplished by going to the repository settings and going down to the red "danger area". Once you've entered the name of the current repository and the name of the new owner, we wait for the new owner to accept the transfer. You can also see these variables have transferred by going back to "More Options", then "Settings" in Travis CI. The values are still hidden behind the input password field. The example above shows two problems. The bigger problem, in my opinion, is that environment variables are transferred to a new owner. The secondary problem is that "secure" variables are really just obfuscated. Accessing them is trivial. With this demonstration, we added in a step to show that the variables can be seen by the original owner. However, it is just as likely that the new owner could introduce such a change after the repository is transferred. 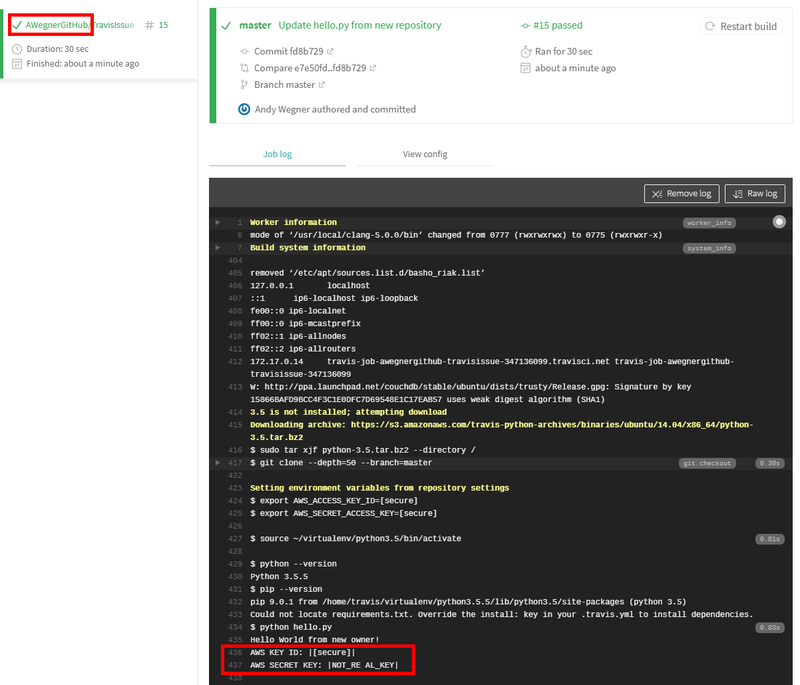 This bug requires the owner of the repository to perform the "dangerous" GitHub action of transferring a repository. That means it's impact is limited. However, it's just as likely that the original owner has forgotten that environment variables were set up in Travis CI, an entirely separate system. When a GitHub repository is transferred to a new owner, the environment variables in Travis CI should not travel with. This is especially true for the "secure" variables. I'd rather that a build breaks after the transfer due to the lack of appropriate variables being set up than having my cloud credentials be sent to a third party. Mitigation of this bug, until Travis CI stops transferring environment variables to new repository owners, requires the original owner to remove the variables prior to transferring the repository. One of the steps that the owner should take is to log into Travis CI and ensure all secure variables have been removed from the Travis CI environment. This will break the builds, but it will also ensure that private variables aren't leaked unintentionally to a third party. The repository for testing is available on GitHub.